Translational medicine just got a shot in the arm with DynaMed teaming up with McMaster University (Health Information Research Unit), along with a body of physicians from around the world, to identify and synthesize practice-changing evidence by monitoring high-quality research across medical disciplines. 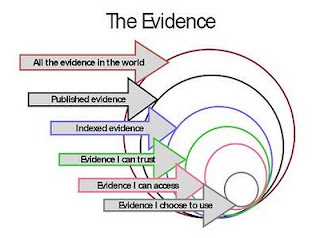 To faciltiate the rapid application of research, DynaMed synthesizes the new evidence, summarizes it into a digestable format, and rates the relevance for decision support. "The sheer volume of the new information being published makes it impossible for a practicing physician to read every article or to identify which articles contain research that needs to be put into practice. Having a mechanism to synthesize the new medical evidence into a useable format and rate the relevance is becoming more and more essential. The agreement between McMaster University and DynaMed provides physicians with the information they need to know—the best available evidence—when and where they need it most—at the point of care." Need help accessing DynaMed? Come and see us in the Library for your EBSCO login and/or your mobile access code. Trying to keep a handle on all the latest in science and medicine is a challenge, to say the least! And what about all those newly coined words that your peers and collegues seem to be regularily adding to their vocabulary, while you are starting to doubt your ability to speak english! Have no fear, the buzz word buster is here! Now we have this great new online dictionary to address this problem. Check out 'Leman's Lexicon' and discover not only what the latest buzz is, but also just what those new buzzwords [such as pharmacogenomics, epigenetics, or translational medicine] actually mean. If you haven't walked on the moon, understanding some of these words and concepts might still give you the edge for your next cocktail party chatter. Oh! and while you are at the site, check out the rest of ResearchRaven for a great compilation of current information about all the medical and scientific research that is happening, conferences coming up, calls-for-papers, etc. Brought to you as a public service by the Center for Health Research and Quality, Samaritan Health Services in Oregon. 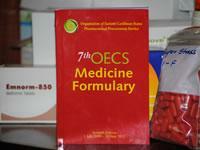 The 7th OECS Medicine Formulary is now available on the Reference shelf of the Anne Ross Library. The formulary is a compilation of medicines used in the public sector of the nine OECS Member countries. An important reference guide to drug information on the indications, side effects and contraindications of medicines in current use in St. Kitts and the other Caribbean member countries of the Organization of Eastern Caribbean States (OECS). Now in it's 7th edition for 2009 -2012, this pocket-size handbook lists over 500 essential medicines, including 127 new medicines. An Artificial Pancreas? Considering the Looming Burden of Diabetes ~ This could be Huge! Research pharmacy news out of the UK describes an artificial pancreas for diabetics being developed by Prof Joan Taylor of De Montfort University, Leicester. This 'smart' polymer device works to mimick the pancreas' role in delivering insulin as and when it is needed by the body. "The implant is still under development and several years from being available to people with diabetes. However it promises to be an alternative to daily insulin injections and insulin pumps. Its design is aimed at reducing the life-threatening complications associated with diabetes." In consideration of the growing burden Diabetes is threatening to impose on our healthcare systems, I had to share this exciting bit of news with the readers of this blog! Listen to the podcast from CBC Radio and then voice your opinion on this latest phenomenon called 'social medicine'. "That's when health professionals blog and tweet and text, not only to each other -- but to their patients. Some even go as far as making friends on Facebook ..."
CBC Radio program "White Coat, Black Art" presents the pros & cons.